Dragonflies don’t sting, and rarely do they bite. Predating dinosaurs, experts estimate that there are over 5,000, perhaps close to 6,500 species of dragonflies in the world today. Dragonflies are an aquatic insect. Beginning their life as larvae in the water, these bottom dwellers disappear beneath sand, silt and rocks, feeding on other insect larvae found in the water, and sometimes even tadpoles. Most of their life is spent beneath the water’s surface; some remain there up to two years. When the larvae are ready to enter their final phase of their lifecycle, they crawl out of the water to find a safe place to emerge from their exoskeleton- or exuvia. Once free of its exuvia, the dragonfly must pump fluid into its furled wings and wait for the wings to harden before taking its first flight. 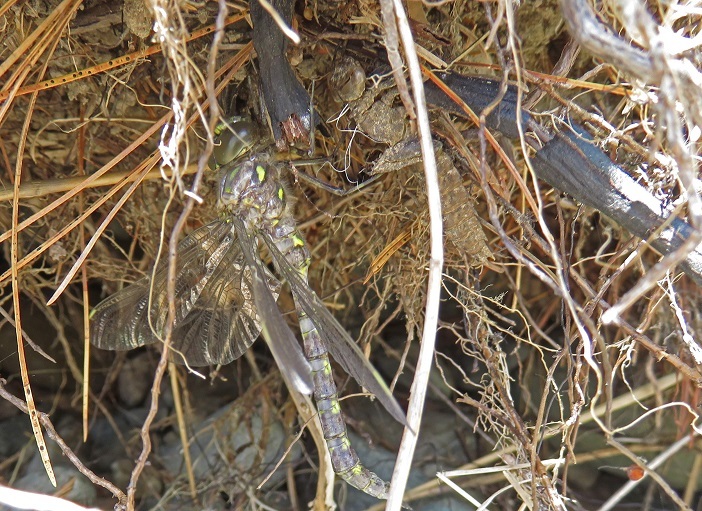 This a vulnerable time for the adult dragonfly as wading birds, raptors and amphibians congregate for the exodus of the larvae from water to land. Once the wings harden, this voracious carnivore will capture and devour mosquitoes, black flies and other insects while in flight. Dragonflies also mate in flight and will return to the water to lay eggs. 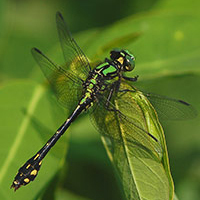 Though a few species of dragonflies migrate, most live as adults for only several weeks or a few months before they expire in cooler temperatures, or more likely, from predation. These mystical creatures have captivated storytellers for centuries, inspired the next generation’s flying robots, and it is also believed that when a dragonfly lands on your head good fortune is coming your way. Oh! And dragonflies also make for popular tattoos these days! Valerie Walker appreciates the function and the beauty of the dragonfly. The former professor of Sault College’s School of Natural Environment and Outdoor Studies, Walker is a member of the Sault Naturalists. 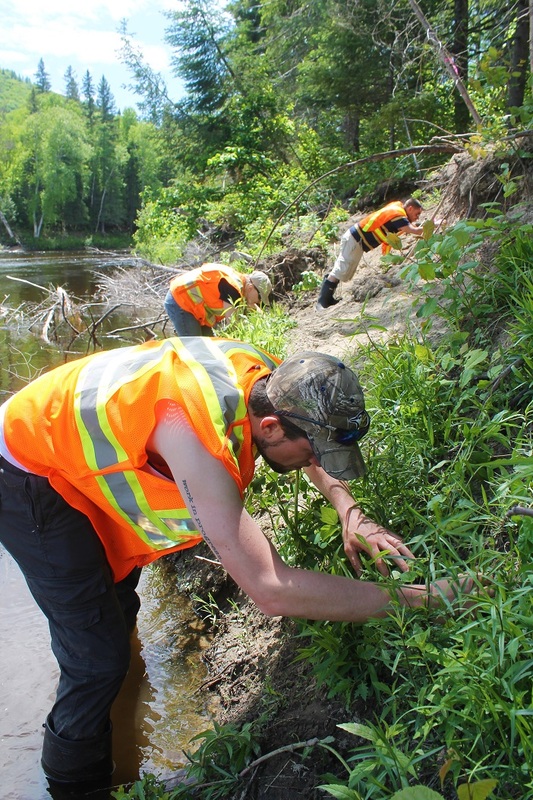 In partnership with the Ministry of Natural Resources and Forestry, and Sault College, the group received a grant through Ontario’s Species at Risk Stewardship Fund. 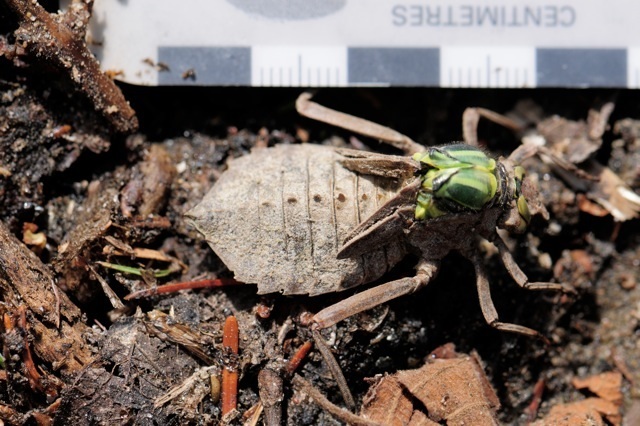 The exoskeleton- or exuvia of a dragonfly found along the Goulais River. Photo courtesy of Chuck Miller. 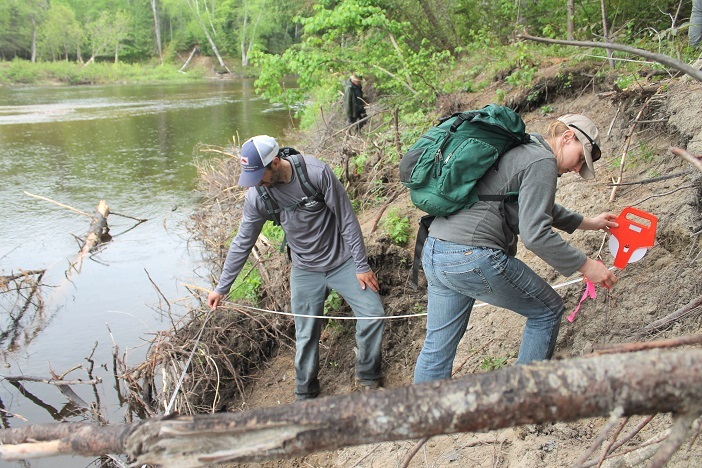 The funding covered two summers of field research in Searchmont, Ontario. Three research sites were located along the Goulais River on Whitman Dam Road where researchers set out to collect the discarded exuviae –or exoskeletons, of dragonflies. 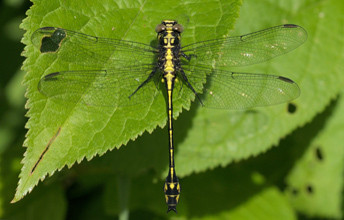 The research has two primary components: the first part an attempt to identify two rare and endangered dragonfly species –the Pygmy Snaketail and the Riveriene Clubtail; and the second part focuses on identification of any dragonfly species in the area. 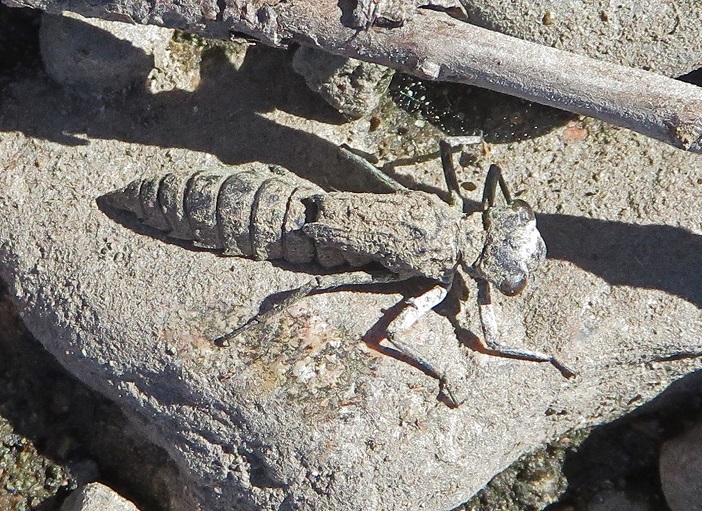 Discovered along the Goulais- the exuvia of a River Cruiser dragonfly. Photo courtesy of Mark Olivier. Establishing the transects. Photo courtesy of Valerie Walker. Searching for exuviae. Photo courtesy of Valerie Walker. fragile they seem to be fairly persistent in being there,” remarked Walker. Last year’s findings, however, did not produce a discovery of either the Pygmy Snaketail or the Riveriene Clubtail though Walker has not yet ruled out the possibility that the second season of collection could produce a positive finding. Researchers altered their collection period this year, and staggered their 21 days of collection beginning at the end of May and completing in early July. The adult dragonfly in process of emerging- and those aren’t two green eyes! “Those are basically his shoulders pulling out of the exuvia. The dragonfly will pull the head and thorax out and then really struggles to get the rest of the body out. Then often it will cling to its own exuvia, using it as a substrate, and pump its wings out and then take off.” ~ Valerie Walker. Photo courtesy of Peter Burtch. Look closely to find the exoskeleton! 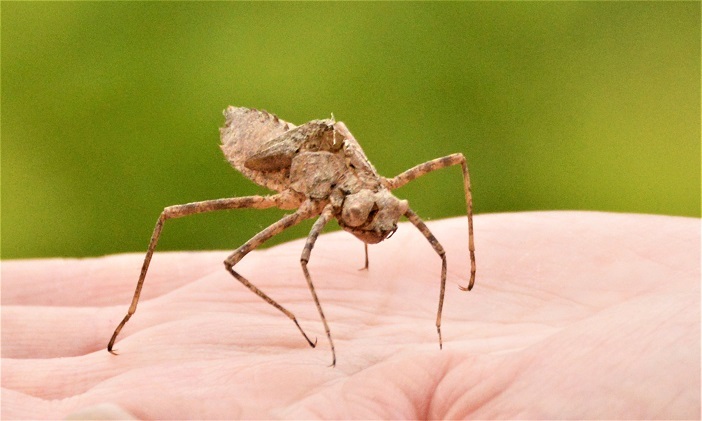 “If we find dragonflies emerging on the site we usually put a stick on the ground and leave it because we want to collect the exuvia but not until the dragonfly is gone. So we watch it and take pictures and then we can actually match up the exuvia to the dragon fly on site. Sometimes it’s amazing how fast they can do it under the right conditions.” ~Valerie Walker. Photo courtesy of Chuck Miller. dragonfly’s greatest risks are typically manmade. Recreational traffic along shorelines or heavy activity like ATVing pose a threat to immature dragonflies. But it is manipulation or quality of the water that most jeopardizes the species.